Here’s the 1968 Popular Library reprint of Henry Kuttner’s 1940 Startling Stories novel, A Million Years to Conquer. It’s interesting to compare this image by legendary cover artist Frank Frazetta with the interior opening spread from the pulp, which I presented in the last post. All in all, this isn’t one of the strongest Frazetta covers in my collection, which is another reason why it didn’t exactly leap to the top of the Henry Kuttner pile (and believe me, that’s quite a pile in my library!). The Creature of the title is sort of the villain of the piece. I say sort of because what’s really going on is that people get crazy irradiated and kill everything they touch, and this is connected to Ardath and his alien people, as mentioned in the previous post. And while the irradiated people become monstrous in aspect, the actual villain of the piece is one of the super-humans Ardath has harvested for his long-term genetics project. 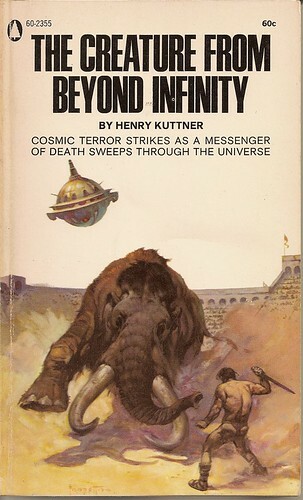 I don’t know if “The Creature from Beyond Infinity” was a reversion to an original title changed by Startling Stories or a new title from someone at Popular Library (which seems likely, as Kuttner was dead by the time the paperback version came out), but either way I think “A Million Years to Conquer” is a better and more fitting title. Decent cover on this one, though. Everybody loves elephants, right?